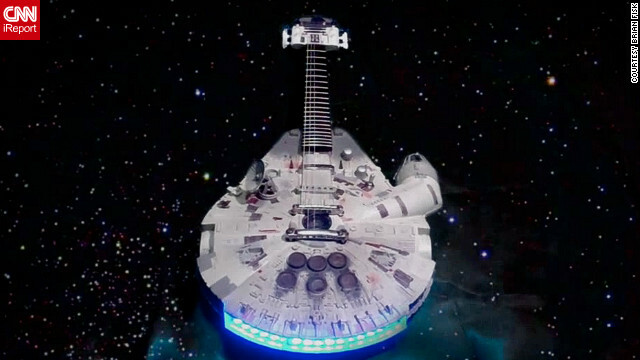 After kittens and squirrels became Jedi Knights, dogs were made to resemble things found on the planet Hoth, and a Stormtrooper cake was brought into existence, it was only a matter of time before someone created a Millennium Falcon guitar. In fact, there are quite a few of those people out there. One of them is Brian Fisk, who designed the guitar after Han Solo and Chewbacca's famous ship as seen in the original "Star Wars" trilogy. CNN Geek Out: What inspired you to create this? Fisk: I saw pictures of a couple Millennium Falcon guitars online and decided they were the coolest things I'd ever seen. I knew I had to make one even cooler. The quest to make it cooler inspired the custom made R2-D2 headstock as well as the working sounds and lights. I have a love for music and am a mild "Star Wars" fan so this seemed like the perfect project for me. CNN Geek Out: Why the Falcon? CNN Geek Out: How difficult was the process of building it? Fisk: It was a challenge to put together. First of all, there is no instruction manual on "How to Build a Millennium Falcon Guitar" and only a few photos from other builds to reference. I spent extra time on nights and weekends for several months to finish this guitar. Almost everything had to be worked out on paper first, then physically constructed, then reworked again because something didn't work correctly. CNN Geek Out: What have people said to you in response? Fisk: I have received some great feedback on this guitar including some quotes like "You sir, are a god!" and "I'm ready to propose." My video has received some mixed reviews because of my less than fantastic guitar playing ability and my overlooked spelling errors, but for the most part I think everyone is enjoying the guitar as much as I am. CNN Geek Out: Anything new on the horizon for you? حج مبرور وسعي مشكور وذنب مغفور إن شاء الله. .وكل عام وأنتم بخير. بالنسبة للقاح إنفلونزا الخنازير، ألم إجبارياًّ؟!! I do consider all of the concepts you have offered on your post. They are really convincing and will definitely work. Nonetheless, the posts are very quick for starters. Could you please extend them a bit from subsequent time? Thanks for the post. I'm sorry – "defiantly wanted"? Like, seriously, does no one proof read this stuff? His email is brianfiskmusic@gmail.com. It is at the end of the video in one of the links in the story 🙂 good luck! It looks like a bee. Hi anonymous- I have just been in touch with the oraingsers of the Guitar Show and they assured me that children are welcome. They only ask that children under 14 years be accompanied by a responsible adult. So enjoy the show! مرحبا geekout.blogs.cnn.com. حصلت على موقع الويب الخاص بك وجدت موقع الويب الخاص بك عن طريق البحث في أثناء البحث عن مسألة مشابهة ، حتى هنا. يبدو جيدا. لدي علامات مرجعية في جوجل بلدي أن أعود في وقت لاحق. What a piece of junk! – – She'll make .5 past high-e! She'll make point five past lightspeed. She may not look like much, but she's got it where it uotncs, kid. I've made a lot of special modifications myself. Very cool! huh, well that's original. kudos. Thanks. I needed that this morning. Death Star banjo? He must have played one at some time or another, 'cause I can tell you from first-hand experience that next to the bag pipes, you pray that a banjo is the one instrument you hope your new neighbor or roommate is NOT learning how to play. Believe me...you can become very unpopular, very quick. It's why I took up the guitar...safer. As for this whachamacallit, feh....I know a luthier that can (and has) make you an instrument out of a used toilet seat that will intonate just as proficiently as this...wall decoration will. Want! Tell you what, I'll hang fake fur off of my drums, you bring the MFG over, and we can jam in my garage. I don't have sheet music for the Mos Eisley Cantina tune, but we could probably work it out.